Author contributions: Twisk FNM designed the study and wrote the manuscript. 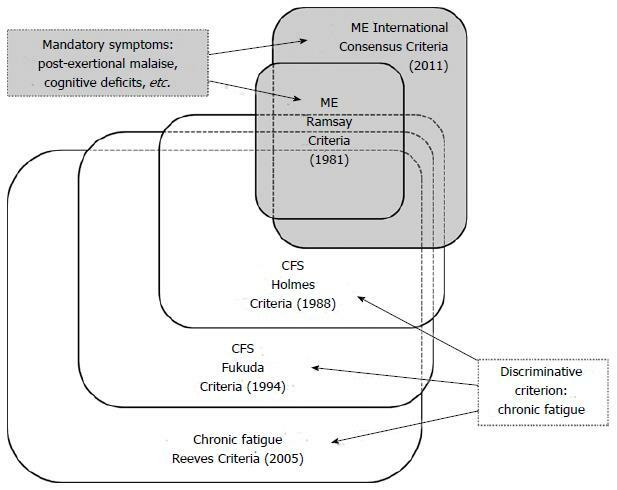 Although myalgic encephalomyelitis (ME) and chronic fatigue syndrome (CFS) are considered to be synonymous, the definitional criteria for ME and CFS define two distinct, partially overlapping, clinical entities. ME, whether defined by the original criteria or by the recently proposed criteria, is not equivalent to CFS, let alone a severe variant of incapacitating chronic fatigue. Distinctive features of ME are: muscle weakness and easy muscle fatigability, cognitive impairment, circulatory deficits, a marked variability of the symptoms in presence and severity, but above all, post-exertional “malaise”: a (delayed) prolonged aggravation of symptoms after a minor exertion. In contrast, CFS is primarily defined by (unexplained) chronic fatigue, which should be accompanied by four out of a list of 8 symptoms, e.g., headaches. Due to the subjective nature of several symptoms of ME and CFS, researchers and clinicians have questioned the physiological origin of these symptoms and qualified ME and CFS as functional somatic syndromes. However, various characteristic symptoms, e.g., post-exertional “malaise” and muscle weakness, can be assessed objectively using well-accepted methods, e.g., cardiopulmonary exercise tests and cognitive tests. The objective measures acquired by these methods should be used to accurately diagnose patients, to evaluate the severity and impact of the illness objectively and to assess the positive and negative effects of proposed therapies impartially. Core tip: The diagnostic criteria for myalgic encephalomyelitis (ME) and chronic fatigue syndrome (CFS) define two distinct clinical entities. Cognitive impairment and post-exertional “malaise” (a long-lasting aggravation of typical symptoms, e.g., muscle weakness and cognitive “brain fog”, after minor exertion) are obligatory for the diagnosis ME, while chronic fatigue is the only mandatory symptom for the diagnosis CFS. There is debate about the nature and severity of the symptoms in ME and CFS. For clinical and research purposes it is essential to accurately diagnose patients using objective tests for characteristic symptoms if possible. This article reviews accepted methods to assess various distinctive symptoms of ME and CFS. There is debate about various aspects of myalgic encephalomyelitis (ME) and chronic fatigue syndrome (CFS), including the nature of the symptoms, the etiology, the pathophysiology and presumed effective interventions, e.g., cognitive behavioural therapy (CBT) and graded exercise therapies (GET). In light of the dispute about the origin of the symptoms, it is essential to assess the presence and severity of characteristic symptoms, and the impact and the disability in ME and CFS impartially as much as possible. In the context of disability, it is important to establish physiological limitations in a specific patient objectively, independently of ones view on the etiology and the pathophysiology of ME and CFS. To date diagnosis, symptom assessment and patient selection criteria of research studies of ME and CFS are often based upon self-report, questionnaires and subjective measures, e.g., fatigue severity and impact. However, well-accepted methods can provide objective measures which can be used to diagnose patients more accurately. This article reviews relevant methods in this context. ME/CFS is often initiated by an infection or another immunological insult. Full recovery from ME/CFS seems rare (5%, 12%). A long-term follow-up study found that people who remitted from ME/CFS had non-significant differences in impairment on 17 out of 23 outcomes compared to those who maintained a CFS diagnosis. So, even patients who don’t meet a CFS diagnosis anymore will not return to their premorbid level of functioning. ME/CFS has a greater negative impact on functional status and well-being than other chronic diseases, e.g., cancer or lung diseases, and is associated with a drastic decrement in physical functioning. In a comparison study ME/CFS patients scored significantly lower than patients with hypertension, congestive heart failure, acute myocardial infarction, and multiple sclerosis (MS), on all of the eight Short Form Health Survey (SF-36) subscales. As compared to patients with depression, ME/CFS patients scored significantly lower on all the scales, except for scales measuring mental health and role disability due to emotional problems, on which they scored significantly higher. Looking at several studies[12-16] the financial consequences of ME/CFS for the individual patient and the economic impact on society are often very profound. This article aims to: (1) compares the diagnostic criteria for ME and CFS; and (2) reviews well-accepted methods to assess characteristic symptoms of ME and CFS objectively. Although ME, CFS and post-viral fatigue syndrome are used interchangeably, the case criteria for ME and CFS define two distinctive clinical entities, delineating partially overlapping and partially disjoint patient populations (Figure 1). Figure 1 Myalgic encephalomyelitis vs chronic fatigue syndrome: Two distinct diagnostic entities. ME: Myalgic encephalomyelitis; CFS: Chronic fatigue syndrome. ME, a neurological disease[20,21], has been described in the medical literature since 1934 under various names, e.g., epidemic neuromyasthenia and atypical poliomyelitis, often on account of outbreaks[23-25]. Characteristic symptoms of ME, classified as a disease of the nervous system by the WHO since 1969, are: muscle weakness, neurological dysfunction, especially of cognitive, autonomic and neurosensory functions; variable involvement of the cardiac and other systems; a prolonged relapsing course; but above all general or local muscular fatigue after minimal exertion with prolonged recovery times (post-exertional “malaise”). The clinical entity CFS was introduced in 1988 and redefined in 1994. The diagnosis CFS is primarily based upon the ambiguous notion “chronic fatigue”[28,29]. According to commonly used criteria for CFS “chronic fatigue” must be accompanied by at least 4 out of 8 symptoms, e.g., tender lymph nodes and muscle and joint pain. However, 5 of the 8 “minor” symptoms, i.e., headaches, lymph node pain, sore throat, joint pain, and muscle pain, do not differentiate people with melancholic depression group from healthy controls. The CFS criteria by definition select a heterogeneous population of people with “chronic fatigue”[31-34]. The diagnostic criteria for ME and CFS define distinctly nosological entities, since cognitive impairment and post-exertional “malaise”, obligatory for the diagnosis ME, are not mandatory for the diagnosis CFS, and the diagnosis ME doesn’t require “chronic fatigue”. The distinction between ME and CFS is illustrated by a study which found that 60% of the “less severe CFS” patents reported post-exertional “malaise” and 45% reported cognitive impairment. This implies that many “less severe” CFS patients don’t fulfil the original or new criteria for ME. Looking at relevant studies[36-39] ± 30%-50% of subjects meeting the CFS criteria seem to fulfil the more stringent International Consensus Criteria (ICC) for ME. How many ME/ICC patients don’t meet the CFS criteria is unknown, since almost all studies until now applied case definitions sequentially, i.e., used other diagnostic criteria on a patient population preselected by chronic fatigue or CFS criteria. In a recent study ME/ICC patients reported significantly more severe disability across all domains of the World Health Organisation Disability Adjustment Schedule 2.0 (P < 0.05), when compared to patients only fulfilling the criteria for CFS. Another study supports the notion that the ICC criteria for ME identify patients with greater functional impairment and move severe physical, mental, and cognitive symptoms than patients who only meet the Fukuda criteria for CFS. Diagnostic criteria applied (Figure 1) are crucial, not only because of the sensitivity and specificity[44-46] of the criteria[19,47], e.g., resulting into the inclusion of people with psychiatric disorders, but also for a judgment about the effects of proposed effective interventions in specific patient populations[49-53]. Clinical assessment has shown to be essential for an accurate diagnosis and establishing prevalence rates. A recent study for example observed that the pooled prevalence of CFS was substantially higher for self-reporting assessment (3.28%, 95%CI: 2.24-4.33) than for clinical assessment (0.76%, 95%CI: 0.23-1.29). In conclusion, ME (Table 1) is not equivalent to CFS (Table 2) or incapacitating chronic fatigue (Table 3). While chronic fatigue is a common complaint, CFS is a relatively rare condition (prevalence rate: 0.19%, 0.20%). The prevalence of ME (CFS), as defined by more strict criteria, is even lower: 0.11%. Table 1 International Consensus Criteria for myalgic encephalomyelitis. Table 2 Fukuda et al Diagnostic Criteria for chronic fatigue syndrome. Table 3 Empirical case definition for chronic fatigue (syndrome). ME/CFS patients often report a plethora of symptoms, which can vary in number and severity among individual patients and fluctuate within an individual over time, possibly as a result of daily activity. Symptoms often reported by ME/CFS patients are post-exertional “malaise”, cognitive deficits (“brain fog”), “fatigue” (lack of energy), muscle weakness, (muscle and/or joint) pain, impaired sleep, a new type of headaches, stress intolerance, orthostatic intolerance and visual symptoms. Various typical symptoms, e.g., post-exertional “malaise” and muscle weakness, can be quantified objectively using accepted, reproducible methods (Table 4), while others symptoms, e.g., fatigue, cannot be evaluated objectively due to their nature. Table 4 Symptoms and tests to assess the disability in myalgic encephalomyelitis/chronic fatigue syndrome objectively. Due to the multi-systemic nature of ME/CFS, objective assessment of symptoms and disability in ME/CFS involves various medical specialists, e.g., cardiologists, neuropsychologists, exercise physiologists, and endocrinologists. The exclusion of psychiatric diseases[18,19] and assessment of comorbid psychological disorders requires the input of psychologists/psychiatrists. Table 4 denominates tests that have demonstrated to yield aberrant results in ME/CFS. However, Table 4 should not consider to be exhaustive. Due to the heterogeneity of the ME/CFS patients population[1,34,88], not all patients will experience all symptoms, i.e., not all tests will show deviant results in all ME/CFS patients. Nevertheless, to assess the clinical status, the severity of the illness, and the disability of an individual patient impartially, patients should be subjected to the abovementioned and other objective tests as much is feasible. ME/CFS is often incorrectly considered to be equivalent to chronic fatigue. “Fatigue” in ME/CFS is a multi-dimensional entity that is distinct from the generalized form of fatigue experienced by the general population. Fatigue in ME/CFS encompasses at least five dimensions: a lack of energy resources needed for basic daily functioning, “brain fog”, post-exertional “malaise”, a “wired feeling” when very tired, and a flu-like feeling. While these latter two aspects of “fatigue” are subjective due to their nature, the first three dimensions can be assessed more objectively. This paragraph focuses on “lack of energy”, while ”brain fog” (neurocognitive deficits) and post-exertional “malaise” will be discussed in the next paragraphs. Cardiopulmonary exercise testing (CPET) is regarded to be an accurate method for assessing functional capacity[62,89]. The (maximum) oxygen uptake (O2) measured at a CPET is associated with the concept of Metabolic Equivalent of Task (MET): the energy cost of a physical activity compared to the energy produced by an average person seated at rest. By definition, 1 MET is equivalent to an oxygen utilization of 3.5 mL O2/kg per minute. The functional capacity established by a CPET can be set against the metabolic requirements of self-care tasks essential for fundamental functioning (Basic Activities of Daily Living, ADLs) and activities crucial to live independently from others (Instrumental Activities of Daily Living, IADLs). Although contradicted by some studies, e.g.,[92,93], various studies, e.g.,[94-98], implicate that the “lack of energy” experienced by ME/CFS patients is reflected in the performance levels at a CPET: a low maximum workload (Wmax) and oxygen uptake (VO2max) and a reduced anaerobic threshold (W AT) and corresponding oxygen uptake (VO2 AT), when compared to sedentary controls. When looking at the “high” mean performance levels of patients in some studies, e.g.,[92,99], contradictory findings are likely due to heterogeneity of the patient samples, e.g., participation rates of “severe”vs“less severe cases”. Whether or not the exercise capacity is decreased or not in an individual patient should be assessed impartially by a CPET. Objective measures should be employed to establish the degree of effort during exercise, e.g., the respiratory exchange ratio at peak exertion (RERmax). According to well-accepted criteria[62,63] a RERmax > 1.10 indicates excellent effort, while a RERmax < 1.0 reflects submaximal effort. Although (some) patients seem to be able to perform at a level comparable to that of sedentary controls once-off, a CPET often has profound negative effects on the exercise capacity 24 h later at a second CPET (see Post-exertional “malaise”). A “lack of energy” seems to be accompanied by hypovolemia (low blood volume)[98,100], low cardiac mass[101-103] and reduced cardiac function[100,104]. Some studies implicate interrelations between hypovolemia and low cardiac output and between hypovolemia and (maximum) oxygen uptake. A reduction of the exercise capacity seems to be associated with typical immunological abnormalities in ME/CFS, including immune activation and immune dysfunction[106-108]. In addition to a reduced exercise capacity, the “lack of energy” of ME/CFS patients seems to manifest itself in post-exertional malaise, muscle weakness and orthostatic intolerance, which will be discussed in separate paragraphs. A second characteristic symptom of ME/CFS is cognitive impairment (“brain fog”). Several studies, e.g.,[112-118], have established a wide range of neurocognitive deficits in ME/CFS. In addition, various studies have observed neurological aberrations[119-121], e.g., reduced white[122-124] and grey[123,125,126] matter volume, electroencephalogra-phy (EEG) abnormalities, hypoperfusion of the brain[128-130], hypometabolism[131,132], neuro-inflammation of widespread brain regions, increased fractional anisotropy in the right arcuate fasciculus and, in right-handed patients, of the right inferior longitudinal fasciculus, and spinal fluid abnormalities[134,135]. A relationship between neurological anomalies and cognitive symptoms has also been observed[136-138]. Some findings indicate that the neurocognitive problems are induced or intensified by exercise[97,139] and an upright (orthostatic) position. Cognitive impairment seems to be more severe in sudden onset-ME/CFS[141,142]. ME/CFS patients can present with moderate to large deficits in simple and complex information processing speed (attention, memory and reaction time), in tasks which require working memory over a sustained period of time[143,144], in tasks which necessitate (simultaneous) processing of complex information[116,117] and in conflict-monitoring tasks (interference control). Specific cognitive deficits, reduced exercise capacity, decreased muscle power (strength and endurance) and immunological aberrations, e.g., inflammation, seem to be interrelated[146,147]. Cognitive impairments can be identified, but only if the appropriate measures are used. This important observation is confirmed by a meta review of 50 studies and 79 tests. All tests for assessing attention, including attention span and working memory, showed significant deficits in ME/CFS. The effect sizes for most word list learning and recall tests were significant, but some tests seem more sensitive to memory deficits in ME/CFS than others. Reaction time is substantially impaired for responses to both simple and complex (choice) stimuli. Only two of the five tests used to assess movement times revealed significant group differences. Most tests for visuospatial ability, verbal abilities and language, cognitive reasoning and flexibility, and global functioning didn’t yield significant group differences. In order to determine cognitive impairment objectively, ME/CFS patients should be subjected to neuropsychological tests[64-67] aimed at the abnormalities found in ME/CFS patients, e.g., attention and memory[112,116,143]. Cognitive deficits don’t seem to be related to “fatigue” or comorbid depression[148,149]. Goedendorp et al have suggested that low cognitive test scores are due to underperformance, but this view is based upon the subjective premise that ME/CFS has not proven to be a cognitive disorder. Objective measures indicate high levels of effort and an intention to do well during neurocognitive testing. Post-exertional “malaise” has been defined as “a pathological inability to produce sufficient energy on demand”, resulting into a (delayed) increase of typical symptoms, e.g., weakness, muscular and/or joint pain, cognitive deficits, after a minor physical or mental exertion, with prolonged “recovery” times[109,153]. Looking at the research, post-exertional malaise in ME/CFS can present itself in several forms, including a decline in physiological exercise capacity at a second exercise test 24 h later[94,154], cognitive impairment induced or intensified by exercise[97,139] and orthostatic stress, and cognitive deficits due to mental exertion, e.g., cognitive testing. These various dimensions of post-exertional “malaise” can be assessed by combining CPETs, tilt-table and specific cognitive tests (Figure 2). The (long-lasting) physical effects of physical exertion (Figure 2A) can be evaluated objectively by subjecting a patient to two CPETs until exhaustion separated by 24 h. The cognitive effects of physical exertion (Figure 2B) can be assessed impartially by comparing the cognitive performance, e.g., simple and choice reaction times, before and immediately after a CPET, the cognitive effects of orthostatic stress (Figure 2C) can be established by subjecting patients to cognitive tests at various stages of a graded tilt table test, while the mental effects of cognitive exertion (Figure 2D) can be assessed objectively by exposing a patient twice to the same cognitive tests with several hours rest in-between. The prolonged negative effect of muscle contractions on muscular strength (Figure 2E), another aspect of the physical dimension of post-exertional “malaise”, will be discussed in the paragraph Muscle weakness. Figure 2 Objective tests for post-exertional malaise. CPET: Cardiopulmonary exercise test; MPT: Muscle power test. Physical effects of physical exertion: A profound decrease in the exercise capacity at a second CPET 24 h after the first CPET seems typical for ME/CFS and is neither observed in sedentary healthy controls nor in patients with other diseases[154,157]. The “exercise intolerance” in ME/CFS can be reflected in significantly lower oxygen uptake and performance levels at exhaustion (VO2max and Wmax) or at the anaerobic threshold (VO2 AT and W AT) at the second CPET. In contrast, the first CPET appears to have a positive effect on the anaerobic threshold in sedentary controls at the second CPET. Due to the first CPET the anaerobic threshold can decrease to a level below 5 METS; a level at or below that which is required by many job-related activities and IADLs. Since many daily activities fall into the 3-5 MET energy range, persons with ME/CFS will exacerbate symptoms simply by completing normal daily activities. A recent study observed that VO2max at the first exercise test was reduced in ME/CFS (mean ± SD: 21.9 ± 4.75 mL/k per min), that all patients showed clinically significant decreases in either VO2max and/or oxygen uptake at the ventilatory threshold (VO2 VT) at the second CPET, and that a classification of impairment based on the VO2max or VO2 VT of the first CPET would result in overestimation of functional ability for 50% of the patients. A real-life example of the effect of a CPET on the performance levels at a second CPET 24 h is summarized in Table 5 (male patient, 45 years, 65 kg). Table 5 Adverse effects of a CPET (CPET1) on the performance levels at a second CPET (CPET2) 24 h later: An example. The VO2max at day 1 was 23 mL/min per kilogram, while the anaerobic threshold was reached at a workload level of 54 Watt (W). The corresponding oxygen uptake (VO2 AT) was 11 mL/min per kilogram. Washing the floor requires 58 W and walking at a speed of 5 km/h 56 W, which implies that the anaerobic threshold (AT) is reached just by doing light household activities or low-speed walking. On the second CPET the AT declined to a workload of 35 W, which is equivalent to the energy cost of ironing (35 W) and walking at 3 km/h (32 W). The oxygen uptake at the anaerobic threshold (VO2 AT) has decreased to 9 mL/min per kilogram on day 2. The difference between the heart rate at the anaerobic threshold and the heart rate at rest is only 9 bpm at day 2. This example perfectly illustrates the (prolonged) negative effects of exertion in ME/CFS. 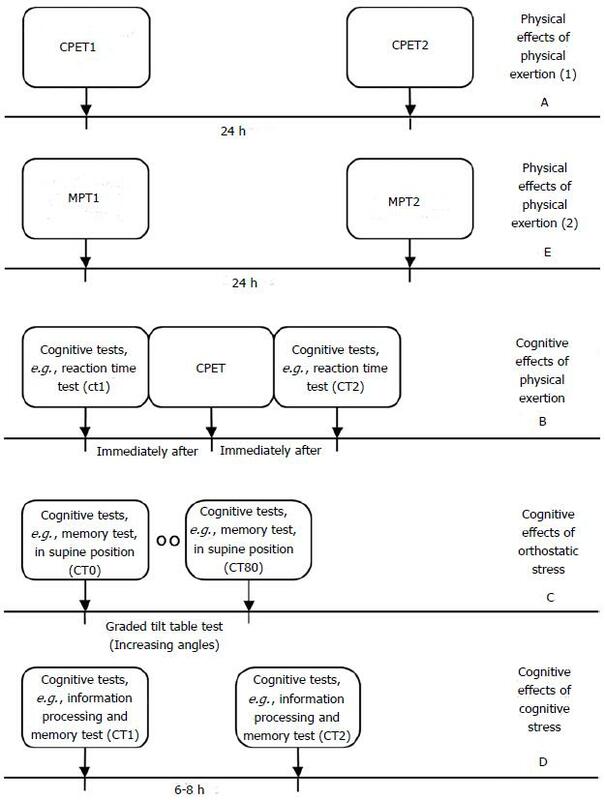 Mental (cognitive) effects of physical exertion: Although research studies into the effects of physical exercise on cognitive performance are scarce, there are several indications that exercise has a (durable) negative effects on cognitive functioning, e.g., focused and sustained attention, simple reaction time and choice reaction times and accuracy at the Symbol Digit Modalities Test, Stroop Word Test and Stroop Color Test. This negative effect seems to be the opposite of the effect of exercise on cognitive performance in sedentary controls. The negative impact of physical exertion on cognitive functioning could be mediated by reduced prefrontal cortex oxygenation during and after exercise and/or diminished cardiovascular response to cognitive stress. The effects of physical exertion on cognitive impairment can be assessed by subjecting a patient to specific cognitive tests[114,143] 0-24 h after a CPET and comparing the results on these tests with the pre-exercise test scores. Mental (cognitive) effects of orthostatic stress: A subgroup of patients present with (delayed) orthostatic intolerance, as implicated by a substantially increased heart rate and/or reduced blood pressure in an upright position (POTS: postural tachycardia syndrome, respectively postural hypotension). Orthostatic symptoms are independently associated with functional impairment. Orthostatic stress seems to impair working memory and information processing, as indicated by a deterioration of scores and reaction times on the N-back test as orthostasis progresses[140,165]. This phenomenon could be related to reduced neuronal activated cerebral blood flow velocity during orthostatic stress. To assess the effects of orthostatic stress objectively, the patient should be subjected to cognitive tests at various angles during tilt-table testing. The N-back test could be a suitable cognitive test, since studies[140,165] have found that while N-back outcome in controls decreased with the value of N, the score was independent of tilt angle, while N-back outcome in ME/CFS patients also decreased with the value of N, but deteriorates as the tilt angle increases. A recent study found that upright tilting caused a significant increase in the N-back normalized response time and a profound drop in cerebral blood flow velocity. Mental (cognitive) effects of cognitive stress: Although scarcely investigated, there are indications that cognitive stress induces long-lasting mental/cognitive effect in ME/CFS. As mentioned in the paragraph Cognitive Impairment, “recovery” from a 3-h lasting cognitive test to pre-test levels of mental energy seems to take much longer in ME/CFS patients. This phenomenon could be associated to a greater mental and neurological effort to process information as effectively as healthy controls[136-138,167]. A recent study observed significant differences between self-reported levels of general, mental, and physical fatigue and depression before and two days after a cognitively fatiguing task. Whether the effects of cognitive stress encompasses a mental dimension in a specific patient, could be assessed objectively by subjecting a ME/CFS patient to cognitive tasks 6-8 h after a fatiguing cognitive test battery and comparing the first and second scores on specific cognitive tests[114,143]. Muscle weakness: Many patients report muscle weakness[30,35,44]. According to a recent study muscle recovery is closely related to cognitive deficits (see cognitive impairment). Several studies indicate reduced muscle strength and endurance and prolonged recovery from muscle contractions in ME/CFS. One study for example found that the hand grip strength of patients was significantly (26%) less than sedentary controls and that the maximum voluntary contraction (MVC) force in the patient group significantly reduced to 83% of the low baseline strength after 50 contractions with 10 s and 50 contractions with 5 s rest between trials. This study also observed deviant EEG-recorded brain signals in controlling voluntary muscle activities, especially when the activities induce fatigue. Another study observed that ME/CFS patients were able to sustain a 10 kg handgrip contraction for less time than healthy controls and that the mean of handgrip contraction strength was substantially lower in ME/CFS patients when compared to healthy controls. A third study found that the maximum twitch interpolated voluntary isometric contraction force of the quadriceps muscle of the dominant leg was significantly lower in ME/CFS patients (interquartile range, IQR: 234N-386N) than in sedentary controls (IQR: 364N-518N). In addition to reduced muscle strength and endurance, recovery of voluntary muscle contractions seem to be prolonged. This is illustrated by a study in which patients and sedentary controls were subjected to an experiment involving 18 MVCs with a 50% duty cycle (10 s contraction, 10 s rest), followed by a recovery phase, lasting 200 min, in which the strength of the quadriceps muscle group was assessed, and a follow-up session 24 h post-exercise, involving three 10 s MVCs. The MVC forces in the control group were significantly higher than those of the ME/CFS patients, with a decline in force over the 18 contractions in both groups. Recovery was prolonged in the patient group, with a significant decline in the MVCs during the recovery phase and also at 24 h-post exercise (73% ± 9% of the initial force levels in patients vs 91% ± 7% in controls). In a recent study patients exhibited lower isometric MVC levels for handgrip strength and slower and incomplete recovery in the 45 min after a fatiguing exercise (18 maximum contractions using a 50% duty cycle, 5 s contraction, 5 s rest), compared to both MS patients and sedentary healthy controls. All in all, muscle weakness in ME/CFS seems to manifest itself into reduced muscle power, declining dynamic muscular endurance and the long-lasting recovery from repeated voluntary muscle contractions (Figure 2E). In order to assess muscle weakness and recovery from muscle exercise objectively and reliably the use of isokinetic and isometric dynamometers is essential[68-71,175-178]. Various studies have observed impaired skeletal muscle metabolism in ME/CFS, e.g., decreased basal values of PCr/(PCr + Pi), increased pH levels during exercise, and low intracellular concentrations of ATP at exhaustion of a graded exercise of the right gastrocnemius muscle[179,180]. In addition to a significant prolongation (almost 4-fold) of the time taken by pH to recover to baseline after exercise, Jones et al revealed the existence of two CFS subgroups: patients with normal PCr depletion in response to a low-level voluntary contraction exercise, but with substantially increased intramuscular acidosis, and patients with low PCr depletion during exertion, generating abnormally low muscle power. An impaired cardiovascular response to standing, orthostatic intolerance, cardiac bioenergetic abnormalities, as implicated by low PCr/ATP values, and reduced muscle metabolism (longer PCr and ADP recovery times) seem to be interrelated. Orthostatic intolerance: Orthostatic intolerance is accompanied by symptoms that arise or aggravate while standing, e.g., light-headedness, blurred vision, fainting and syncope. Several studies[182-185] indicate orthostatic intolerance in ME/CFS patients or subgroups. Altered cardiovascular autonomic control and responses to orthostatic stress are associated with other typical symptoms, e.g., cognitive deficits, and disability. Since orthostatic intolerance is already present in the early stages of the disease[182,187] and CFS patients with POTS were have found to be significantly younger and to have a shorter length of illness than CFS patients without POTS, it seems unlikely that prolonged inactivity accounts for the orthostatic symptoms. Orthostatic intolerance (in ME/CFS) seems associated with specific cardiovascular abnormalities in an upright position[111,189-191], e.g., POTS and neurally mediated hypotension (NMH). These cardiovascular aberrations can be assessed using a tilt table test. The head-up tilt testing is considered a clinically useful diagnostic tool to assess susceptibility to orthostatic intolerance in patients with syncope, allowing reproduction of the patient’s symptoms in a safe environment, under medical control[72,192]. With regard to deviant cardiovascular responses to orthostatic stress five types of abnormalities can be distinguished (Table 6). Table 6 Manifestations of orthostatic cardiovascular abnormalities. In a tilt table test a patient has to lie on a special table/bed, which gradually moves in posture from lying to an “upright position”, e.g., 70 degrees. Heart rate and blood pressures are monitored at various angles in order to establish hemodynamic abnormalities in a specific subject. It is relevant to note that the abovementioned aberrations seem to occur delayed and suddenly in ME/CFS[163,195]. So, in order to assess potential orthostatic abnormalities in a patient, the patient should remain in an “upright” position as long as possible, preferably longer than 15 min. Defective stress response: Not only physical but psychological stress as well seems to intensify the symptoms in ME/CFS. This phenomenon seems to be associated with hypothalamic-pituitary-adrenal (HPA) axis dysfunction[197,198], including hypocortisolism and deviant physiological responses to stress. HPA dysfunction in ME/CFS can manifest itself in reduced levels of stress hormones, e.g., cortisol, at specific moments of the day[199,200] and aberrant diurnal production of specific hormones, e.g., cortisol, cortisone and adrenocorticotropic hormone (ACTH)[201,202]; a blunted response to provocation, e.g., by insulin, ACTH or CRH; a (long-lasting) deviant response to psychological or physical stress[205,206], and an enhanced sensitivity of the cellular immune system to glucocorticoids[207,208] and increased negative feedback of glucocorticoids to the HPA axis[209,210]. HPA axis dysfunction is not likely to be the primary cause of the illness, since HPA axis hypofunction, e.g., hypocortisolism, is only present in a subgroup of patients[200,211], HPA axis abnormalities manifest themselves at a later stage of the illness[212-214] and hydrocortisone/fludrocortisone seem to have limited or adverse effects. HPA axis dysfunction in ME/CFS can result into (1) low basal levels of ACTH; (free and total) cortisol (according to gas chromatography-mass spectrometry and high-performance liquid chromatography are considered to be the golden standard for assessing cortisol levels), DHEA/DHEAS and noradrenalin at specific moments of the day, e.g., at awakening; (2) reduced synthesis of ACTH and cortisol during the day; and (3) blunted HPA axis responses to “provocation”, exercise or psychological stress. Tests[75,217] to assess HPA axis dysfunction objectively should be aimed at these aberrations. ME/CFS has also been associated with thyroid dysfunction. This finding is in line with inflammationmediated loss of thyroid function[219-221]. Thyroid dysfunction can present itself in (1) low (free) thyroxine (T4) levels, due to decreased levels of thyroid stimulating hormone (TSH) secreted by the pituitary or a blunted response of the pituitary to TSH; (2) by reduced uptake of triiodothyronine (T3) and T4 by the cell[223,224]; (3) by diminished T4-T3-conversion, resulting into increased levels of reverse triiodothyronine (rT3)[225,226]; (4) by a diminished production of TSH and free T3 and T4 after administration of thyrotropin-releasing hormone (TRH); and/or (5) antithyroid microsomal antibodies. Thyroid tests could reveal if these aberrations are present in a particular patient. Sleep impairment: Many patients report sleep disturbances[30,35,230,231], e.g., insomnia, frequent awakenings, vivid dreams/nightmares and day/night reversal. Non-restorative sleep is the most specific and sensitive “minor” symptom of CFS. Sleep seems to be disturbed differently patterns in ME/CFS patients with and without comorbid fibromyalgia. Abnormalities have been observed in reduced theta, sigma, and beta spectral power during the various sleep stages and shorter duration and higher frequency of transitions between the sleep stages[234-239]. Some methods to establish sleep dysfunction in ME/CFS objectively are: polysomnographic sleep investigation (EEG), aimed at the frequency of transitions between and the duration of sleep phases[233,237] and spectral power analysis[235,239], the maintenance of wakefulness and the multiple sleep latency test, although the latter two could be considered subjective, and not objective tests. Visual symptoms: Patients often report visual symptoms, e.g., problems with focusing, blurred vision and light insensitivity[240-242]. While various visual symptoms can be qualified as subjective, some aspects of the visual function can be assessed objectively. Abnormal visual attention, e.g., conjunctive search (with divided and selective attention) and spatial cueing (selective attention with distraction), can be assessed with the Useful Field of View test[84,85]. According to a recent study dysfunctional eye movements in ME/CFS can present itself in reduced antisaccade focus accuracy and less precision and speed at smooth pursuing a target. While several symptoms can be assessed objectively, other characteristic symptoms[18,30] can’t be quantified easily due to their nature. These symptoms include pain (muscle and joint pain, headaches, etc. ), abdominal pain and other gastro-intestinal symptoms, “sickness behavior” (flu-like feeling, depression, etc. ), intolerance of light (photophobia), sound (phonophobia) and odors (osmophobia), food and chemicals, and disturbed thermoregulation[18,30]. However, several of these symptoms could logically be explained by aberrations observed in ME/CFS patients or subgroups. Pain e.g., could be the result of (1) inflammation[245,246]; (2) reduced oxidative metabolism[180,247], mitochondrial dysfunction[248,249] or damage[250,251]; (3) low cardiac output[101,185] and reduced blood and oxygen supply to the brain[98,129] and muscles[252,253], possibly leading to acidosis[181,254], accelerated glycolysis and elevated lactate levels[132,255]; (4) central sensitisation, as a potential sequel of inflammation[257,258] and oxidative and nitrosative stress[259,260]; and (5) elevated pain receptors[261,262]. When assessing patients it is crucial to keep in mind that while various symptoms are obligatory for the diagnosis ME, they are not obligatory for to fulfil the CFS diagnostic criteria. As argued, objective tests are to be preferred when possible. Nevertheless, when questionnaires and subjective measures are used to assess the clinical status of a patient, applying minimum thresholds for the frequency and the severity of symptoms (e.g., moderate severe about half of the time) can reduce the likelihood of possible misclassification of healthy persons and ME/CFS patients. ME/CFS has a profound effect on the functional status[10,263] and life[264,265] of patients. As argued in this chapter, an objective assessment of the clinical status can quantify the severity of characteristic symptoms, e.g., cognitive impairment, low physiological exercised capacity and the detrimental effects of exertion. However, next to the illness burden, patients experience serious medical, financial, social and psychological consequences of their illness, which can have a profound impact. An objective assessment of symptoms could help to resolve the controversy around the nature and impact of ME/CFS within the medical profession. Patients for example often report negative experiences with health care workers. Some medical professionals don’t consider ME/CFS to be a legitimate illness. Despite the neurological classification of ME/CFS[17,26] and various neuro-immunological abnormalities in ME/CFS observed repetitively[18,268], 84% of respondents in a survey of members of the Association of British Neurologists answered they did not consider ME/CFS to be a neurological condition. According to a study only half of the general practitioners (GPs) believed that ME/CFS actually exists. In a survey patients reported that they felt that the doctors psychologized too much or trivialized the symptoms. Increasing physical activity had been recommend by doctors, but most of the respondents reported that this made them worse. ME/CFS often has a huge impact on the occupational status and income of patients, school attendance and performance of young patients, and the income of parents of children with ME/CFS. A substantial proportion of ME/CFS patients, 50.1% according to, has to discontinue their employment due to their illness. Looking at the data of various studies[12,13,14] the average annual direct cost (medical costs, etc.) vary from $ 2342 to $ 8675, and the indirect cost (work productivity losses, disability reimbursements, services provided by family members, friends and others, etc.) vary from $ 8554 to $ 20000, for men: $ 23124[12,15,16]. Based upon the prevalence rates of the direct and indirect cost of ME/CFS to the US society could be estimated at $ 8.5-$11 billion annually. The prevalence of ME/CFS in children based upon a cross-sectional national sample among GPs was 0.111%, which is comparable with other prevalence figures. The impact of ME/CFS on school attendance of children and adolescent is profound. On study for example found that 62% of children and young people aged under 18 years with ME/CFS, attended 40% of school or less. Another study observed that 45% of young patients with ME/CFS (aged 10 to 18 years) reported > 50% school absence during the previous 6 mo. A substantial subgroup of young patients, 29% of patients aged 12-18 years according to Bould et al, reports symptoms of comorbid depression, which seems to be associated with the degree of disability. The prognosis of children with CFS seems better in adolescents, e.g., in CFS induced by infectious mononucleosis[277,278], but in both adults and adolescents the severity of the acute phase seems to be the sole predictor of the outcome[187,278]. ME/CFS also can have serious social and emotional consequences, e.g., marginalisation, social isolation, stigmatisation and transformation of identity. Many patients with ME/CFS feel that their illness is not acknowledged as a legitimate illness within the social and medical context, and patients often report marginalization from family, friends, and medical professionals. Not being able to be with friends or to attend school, makes adolescents with ME/CFS feel isolated, different and forgotten. ME/CFS can also result into a transformation in identity[272,279] and values, expectations and life priorities. In addition to destroying relationships and careers, ME/CFS also can disrupt self-perceptions. Much of the stigma experienced by ME/CFS patients seems to originate from the associations with the name CFS, the lack of diagnostic biomarkers and the absence of clear-cut etiologic models for ME and CFS. Questioning the veracity of ME/CFS might represent a potent stressor in ME/CFS, and even coping methods thought to be useful in other conditions, are not associated with a reduction of distress among those with ME/CFS. Doctors’ beliefs can result into negative stereotyping of ME/CFS patients. However, there don’t seem to be major differences between the personalities of ME/CFS patients and patients with rheumatoid arthritis and the stereotype of ME/CFS patients as being “perfectionists with negative attitudes toward psychiatry” doesn’t seem to be applicable. ME/CFS is a serious disorder, which can have profound consequences on a patients’ life and health status. In addition to the impact of the symptoms on everyday life, patients often disbelief, e.g., when claiming disability related benefits. Due to the fact that “chronic fatigue” is an ambiguous and subjective notion, that patients often report a plethora of symptoms which can fluctuate over time very rapidly, and that there are (yet) no clear-cut etiological models for ME and CFS, patients frequently encounter difficulties in proving their level of disability, which can have substantial financial consequences. An objective assessment of core symptoms could not only impartially confirm the patients’ self-reported disability, but could also contribute to reversal of other problems experienced by patients, e.g., stigmatization and the attitude of medical professionals towards the illness(es) and patients. In this context and in light of the controversy surrounding ME and CFS, it is essential to establish the functional (dis)abilities of a patient (output or functional consequences) objectively without an a priori judgment about the causes (the “black box”: etiology and pathophysiology). However, establishing the functional impact objectively using well-accepted tests, e.g., (repeated) exercise tests (CPETs), neurocognitive tests and tilt table tests, also could point towards the physiological origin of various symptoms, e.g., post-exertional “malaise”. One very relevant limitation with regard to the objective assessment of symptoms relates to practical and ethical perspectives, since moderate and severe cases of ME/CFS may not be able to perform specific tests, e.g., CPETs and tilt table testing, and the ethics of requiring patients to undertake a test likely to intensify pain and other symptoms could be questioned. Assessing symptoms objectively, if possible, instead of using questionnaires and subjective measures, could also largely improve scientific progress. For example, the controversy about the claim that CBT and GET are effective interventions[49,288] without detrimental effects, which is challenged by others[50,290], could be resolved by subjecting the patients to objective tests, e.g., CPETs and cognitive tests, before during and after CBT/GET. Especially since studies have shown that reduction in “fatigue” after behavioural interventions is not reflected by a clinical improvement in objective terms, e.g., activity levels, distance walked in 6 min or oxygen uptake. Future trials into proposed effective pharmaceutical[52,53] and behavioural therapies[49,288] should be using objective measures to establish positive and negative effects in clear-defined patient populations impartially. Although the labels ME and CFS are often used interchangeably, the diagnostic criteria for ME and CFS define two distinct, partially overlapping, clinical entities. ME, whether defined by the original or the new consensus criteria, is not equivalent to CFS. Muscle weakness, cognitive impairment, and above all, post-exertional “malaise”, obligatory for the diagnosis ME, is not mandatory for the diagnosis CFS, while “chronic fatigue”, the core feature of the diagnosis CFS, is not mandatory for ME. Partly due to the subjective nature of the symptom-based definitions of ME and CFS and the use of self-report, questionnaires and subjective measures, some researchers and clinicians have questioned the physiological origin of the symptoms and qualified ME and CFS as functional somatic syndromes. The use of objective tests and measures to assess symptoms and functional limitations, e.g., CPETs and cognitive tests, could resolve the controversy with regard to the nature of ME and CFS and the consequences for patients’ lives and professional abilities. Looking at the medical, financial, social and emotional impact of ME and CFS on patients and society, and the future perspective of patients, an objective assessment of the symptoms and disability is a crucial step. To explore the etiology and pathophysiology in well-defined ME and CFS patient subgroups research should employ objective test and biomarkers. Therapies proposed to be effective for ME and/or CFS, should be evaluated by employing an objective assessment of the clinical status and biomarkers before, during and after the intervention in well-defined patient (sub)groups.